1. Direct drive spindle motor system provides minimum power loss of transmission and stable running performance. 2. Tool loading capacity: 16 tools (24 tool magazine optional). 3. MW1500-001+APC: automatic Pallet Changer (A.P.C.) is driven by rotary CAM type mechanism which provides smooth and fast pallet changing. 4. Pallet changing time is only approx. 6.5±2sec. 1. Control unit: FANUC series/ MITSUBISHI-MELDAS series. 2. Spindle: 80~8000rpm(STD.) 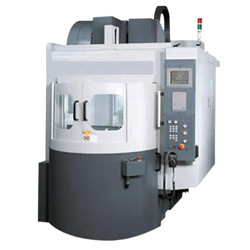 120~12000rpm (OP. ), ISO#40 taper, 7.5KW(10HP). 3. Table: L x W=600 x 400 mm(23.62" x 15.75"), working area-X,Y axis=560 x 410 mm(22.05" x 16.14"). 4. Main travel: 560/ 410/ 410mm (22.05"/ 16.14"/ 16.14"). 5. Feed: rapid traverse X/Y/Z axis: 48m/min(1890IPM), cutting feed rate: 1~15000mm/min. (0.039-590.55IPM). 6. Automatic tool change: (1) Tool specification: BT-40. (2) Tool change time: (60HZ/16T). (3) T.-T./C.-C./no. of tools/max. tool dia. (adjacent): 1.25sec/ 2.5sec/ 16+1/ 24+1(OP. )/ 80mm(3.15"). (4) Tool change method: double arm swing method. (5) Tool selection method: random. 7. Floor space: L x W x H=1800 x 2980 x 2700 mm (70.9" x 117.3" x 106.3"). 8. Packing size: L x W x H=1940 x 2900 x 2540 mm (76.4" x 117.2" x 100"). 9. Weight: N.W./ G.W. : 4350/ 4800Kgs (9570/ 10560Lbs). 10. Automatic pallet changer: 11. Exchange method: pallet lift+180° rotary. 12. Changing time: 6.5±2sec. (1) Floor space L x W x H: 2005 x 3600 x 2700 mm (78.9" x 141.7" x 106.3"). (2) Packing size L x W x H: 1940 x 3320 x 2540 mm (76.4" x 130.7" x 100"). (3) N.W./ G.W. : 5000/ 5500Kgs (11000/ 12100Lbs).